i don’t do resolutions, per se. just a nice to do list that gives me a nudge for the new year. well, what would a new year’s to-do list be without “take more photos” as number 1? i mean, it’s almost expected at this point. so, take more photos. visit the state parks i want to visit. after last year’s whirlwind visits, now i know which parks i want to go back to. i’ve got an itasca trip already planned. i’d like to head up to grand portage and actually spend time there. i also wouldn’t mind camping at blue mounds. is this the summer i perhaps run TWO half marathons? maybe! we’ll see what happens. i’m already signed up for the earth day half, and training starts in 3 weeks for that. seeing training on the horizon gives me hope that winter will come to an end. put in new floors in my house. i’ve got flooring for the entryway, which is my test subject. if that goes well, we’ll give the kitchen a go and see what happens from there. this also means i’ve got to paint my cabinets. i signed up for a yoga program through fightmaster yoga and i hope it makes me more diligent in my yoga-ing. i do yoga pretty often, but it would be great to make it a daily thing. speaking of a daily thing, remember when i blogged EVERY DAY for a year? i don’t know if i should try that again or if i should just think about it and dismiss it. do something interesting with nate – i like that on my list because it makes me think about something interesting to do with him. 2018 was a good year for doing stuff; let’s make 2019 a good year too! I GUESS I’M TURNING 40. i hope something happens for it. 2018: how much worse can it get? oh what the heck, we’re throwing take more pics on the list again. i know i’ll be taking SOME photos, so we’ll see if i can up my game a little bit. my officemate convinced me to bring over the “do something interesting with nate” item from last year since it really wasn’t accomplished. in 2018? i KNOW i’m going to do something interesting with nate. we’re going to arizona in february for my cousin’s wedding, then we’re taking a trip up to the grand canyon and over to mesa verde. …and possibly unattainable in 2018: visit all the MN state parks. in fact, i’m going to say right now that i’m probably going to need to push this out to 2019. but at least i’m thinking about it! start thinking about either a BWCA trip or superior trail hike with liz. i think this will depend on her schedule. at this point i’ve got a pretty flexible schedule compared to her. consider bees and chickens again. do i want that responsibility? i mean, i can’t even correctly grow brussels sprouts, and the only reason the cats get fed is because they meow in my ear. running? hmmm. ragnar is another possibility in 2018. possibly the granddad half relay with liz. one thing i wouldn’t mind doing that i’ve never done is volunteering at a race – being the water person or cheerer or something. strive toward a more healthy lifestyle. ugh. this is so cliche with a new year. but i want to do more yoga, and i want to maybe up my speed with running. i’m not going to say “i’m going to lose 30 lbs and increase my run time by 1 minute/mile” but if i can accomplish something, that will work. in conjunction with the healthy lifestyle thing is mindfulness. my anxiety levels have actually been pretty ok (i think due to work being less stressful). yoga is super good for mindfulness, and i got a great workbook from my mom that incorporates writing with mindfulness. i might also start using the headspace app again, which is a meditation app. there’s something about clearing your mind and focusing on the present. continue being happy. even if the rest of this list isn’t touched, if my life is relatively happy, then i’ve accomplished all i need to accomplish for 2018. i’ll continue SUPping on lake sag, working on my garden, reading, writing occasionally, petting cats, and hanging out with nate and my fam. there’s not too much else a person can ask for out of life other than being happy. so, we can come to the conclusion that 2016 was not good for celebrities, politics, or bernie sanders fans. it wasn’t bad for me, generally speaking. lots of good things happened. a lot of things kind of put me in a holding pattern, but ultimately, i think 2016 was ok. good jorb, 2016! so what’s to come in 2017? i think my resolutions list will mainly be a list about home improvements, now that i have a GIANT ACRE of land. longstanding resolution: TAKE MORE PICS. i’m excited for my august photoshoot i’m a part of! it should be fantastic and fun! another longstanding resolution: get a garden in! i’m torn on where to put it, and i think keeping the riffraff out (aka the deer and bunnies) will be a challenge, but it should be super duper fun. get a compost pile going! like, a real one. i’m not sure what to do on the running front. maybe i can just say, resolve to run as much as i comfortably can and do a couple races. there’s a relay half marathon in la crosse in early may that might be a possibility liz and i decided to run the earth day half marathon here in st. cloud. bring it on (i guess). i like last year’s be happy resolution. i think this year, i want to scale back on connectivity ALL. THE. TIME. i was just listening to npr this afternoon, and they were talking about “ambient news” – you know what’s happening all the time because you’re checking your social media all the time, and you’re getting blasted with everything, ALL.THE.TIME. it’s agitating, kind of nerve-wracking, and constant. i’ll be informed! i just won’t be immediately informed. and possibly fake informed. this would require some adjustments; i’d have to get a dumb phone. i’d keep my iphone, but i’d use it for running tracking mostly. and mobile bank deposits. i’d keep my extra sim card in it so i wouldn’t be tempted. so no more emojis and no more camera on me all the time. it’d be weird, but i think, ultimately, it’d be really good for mental health. now i just have to find a dumb phone. if anyone has one that works with at&t or tmobile, let me know. huzzah i met my reading challenge for the year! i set a goal of 60 books, and i met it. (not that the last two years haven’t been great reading years). generally there are a couple books each year that i start and then decide, naaahhh, and toss aside. i mark them as “read” on my goodreads because otherwise they just hang out in my queue forever. i know in 2013 i started infinite jest – a lot of pages – and quit after less than 100 pages. so these numbers aren’t completely indicative of my reading habits. BUT this year, i know of two books i quit – one i was 3/4 done with (just couldn’t anymore) and the other i’d gotten about 1/4 of the way through – that one was “duma key” by stephen king, so it was pretty long. i wish i could set a goal by pages, not books read. i can choose books that are 250 pages or books that are 800 pages, and they both count as one. see ya 2016. bye. just go away. anyway, let’s take a look at my resolutions for this year and see where i ended up. same old same old: take more pictures. train for the half marathon liz and i signed up for in may! maybe a deck this year? spend more time at whitewater. it worked well last year; i should be able to keep the trend! another garden – fine tune my plant-starting skills. they need help. let’s try kablpoye again. i felt like it was a good exercise in making sure i wrote every day, and i know my four readers enjoyed it. every day blogging, here i come. i think i should just focus on being happy! whatever makes me happy, i’ll try to do. same old same old: FAIL. BUT. summer 2017 i got another gig doing a photoshoot for a book. awesome! CHECK! train i did, and finish we did!!! in may, liz and i ran a half marathon in sub 13-minute miles! it was long. it was difficult. it was really hard on my hamstring. BUT WE FINISHED. huzzah! now liz wants to do a marathon. i’ve got to get my foot figured out before then. well, yes. we did put on a deck. unfortunately, i don’t get to enjoy it. a garden DID happen. i had a ton of tomatoes and a ton of pumpkins – it was awesome. however, i didn’t get to spend as much time as i’d’ve like in it. trip? did someone say TRIP???? OMG. CHECK. i went on a TRIP. jane and i went to california!!! it was awesome. i’d go back. FAIL. every day blogging just didn’t happen. i don’t know if i’d try it again. i’ll have to think about it. you know what makes me happy? being in central minnesota. and guess what. i made that happen. in april i had an interview at the college and accepted the job offer. started commuting between st. charles and st cloud in may, and in july, someone put an offer on our house. we bought a house in avon, just four miles from the st. john’s campus. in september, we closed on both houses and moved up here. there are some little things that i forgot about – namely the traffic and the hatred – but overall, it’s VERY GOOD TO BE BACK. and nate just got a full-time job at the holiday station in albany, so things should be smoothing out. i’d call this one a check, even though it took some work to get there. CHECK CHECK CHECK! some not so great things about 2016: my grandma died. she’s been on a downhill slide for a long time, and about 5 months prior to her death, she was pretty much bed bound. so that sucked. i did get to see her a few times before she died, so that was good. so while 2015 was not a BAD year, it was definitely a bipolar year, to say the least. the end sucked. but i got a chunk of my resolutions for the year done. let’s see what we can do next year. it’s that time of year! time to review my resolutions from last year and see how i did. 1. repeat of my oldie but goodie: take more pics! i will continue from last year! 2. DECK. let’s do this. 3. do something about my basement? maybe? start on it? i’m more focused on a deck at this point. 5. VACATION. ok, this is not a resolution because the reservations are already made, but it might change up before we go, so i’ll stick it on there. 8. gotta do something with running/eating. i glimpsed sub-200 last year and then frittered it away with christmas. i’m going to start going to yoga classes, and that along with maybe half marathon, and hopefully healthier eating, might get me under that again. 9. HIKING. make a plan with liz about hiking the lake superior trail in the next few years. this requires a lot of gear, but i’m hoping between craigslist and other secondhand stuff, we’ll be able to outfit ourselves on the cheap. 10. last year i made plans to spend time in whitewater park. never happened. this year i’m hoping to actually make good on that. also, if i want to hike the LST, gotta start training! ok i failed pretty hard on this one. i DID actually do some pro photowork, but just heading out and taking more pics was not something i did well this year. granted, i did take pics, just not as much as i’d like. well, sort of? i got a toilet and a vanity for the bathroom. GARDEN. CHECK. holy cats, a giant check. VACATION. CHECK!!!! even though we were sick, it was fun! well, i did make some money from my photography! it sort of fell into my lap, but it was fun! half a check? i ran 8.5 miles in one go last summer. liz and i signed up for a half marathon in may. here we go! so that didn’t go well at all. but with the half marathon on the horizon, i know that losing weight will help with time and actually finishing, so i have to work on my eating habits. i thought about this. i don’t know when it will happen, if it will happen, but i’ve been sort of looking for gear and keeping it in the back of my mind. i went to whitewater quite a bit! charlie and i went hiking a couple times, and i went for a run once out there. bought a state park sticker and actually used it! overall, not too shabby! time to start thinking about next year’s resolutions. my blog-posting year was an almost success. i took a break over some vacation time, and i missed a couple days. overall, however, i made it a priority to post at least SOMETHING every day last year. basically, should i continue writing every day? will you read it? what do you want to see? since i did so well on last year’s, one can only hope i follow up accordingly. one of my “guidelines” for 2014 was to be more musical. 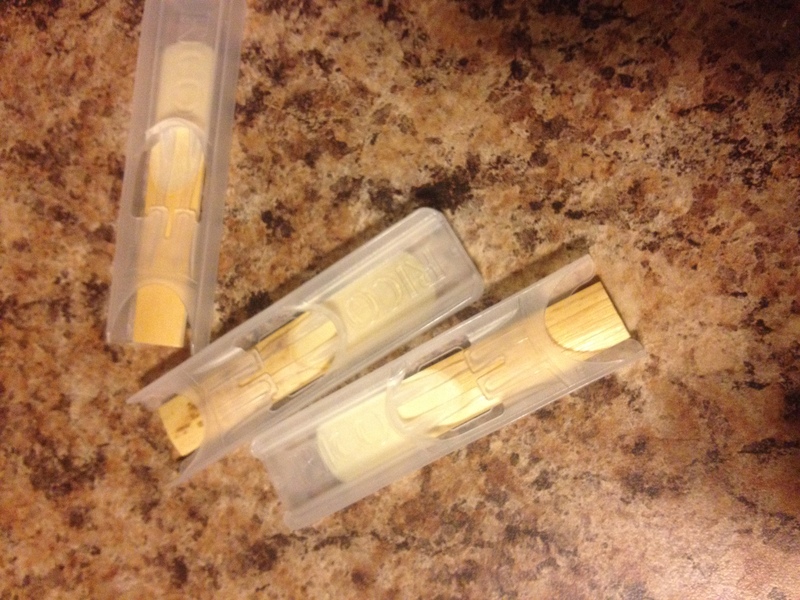 well, the other day i went to schmitt music and bought some clarinet reeds. after some poking around in some boxes, i found my clarinet music, and so begins more musicalness in my life. for reasons UNBEKNOWNST TO ME* i have lost my etudes for clarinet, but i still have a lot of sheet music, so i think i’ll be good as far as music goes. *that was total sarcasm and a lie. i’m sure i got rid of them because they were the bane of my existence during my first semester of college. bruce thornton, you were the worst clarinet teacher i’ve ever had.